This two-year-old article and it’s little coverage in mainstream media illustrates how apartheid state Israel under Bibi can do almost anything it wants towards the Palestineans. Tearing down their villages and homes, and even kill unarmed men, women, and children without the same level of rage from the international community that apartheid state South Africa ones experienced. In South Africa the whites wanted the blacks as workers, Israel is, therefore, worse to the Palestineans because the Israelis just want them gone from their land. It is not antisemitism to be outraged by the behavior of Israels Government and it’s armed forces, the genocides on Jews during WWII does not exonerate Israel and it’s people to commit atrocities against Palestineans. – Israeli security forces may have committed war crimes and crimes against humanity in killing 189 Palestinians and wounding more than 6,100 at weekly protests in Gaza last year, United Nations investigators said on Thursday. Hundreds of companies are doing business in around 250 illegal settlements in the occupied Palestinian territories, that are effectively subsidised and maintained by the Israeli government. In December, a United Nations’ database of businesses that operate in the settlements is due to be finalised. Israel and the US have attacked the database and want to prevent its release. On November 26, Israel’s UN ambassador, Danny Danon, told The Associated Press “we will do everything we can to ensure that this list does not see the light of day”. The database is being established under the auspices of the UN Office of the High Commissioner for Human Rights (OHCHR). This effort has recently been supported by dozens of international and local rights groups, including Amnesty International, the International Federation for Human Rights, and Human Rights Watch. As a regulatory initiative for the UN Guiding Principles on Business and Human Rights (UNGP), the database’s aim is to help businesses and states ensure that they do not contribute to or benefit from activities in Israel’s settlements. The UN is due to release the database by the beginning of 2018, after reportedly engaging with as many as 150 companies, of which 60 are foreign and the rest Israeli. To protect the legitimacy of the database and shield it from criticism, the UN must clarify its function, and show that it is not a punitive device but a vital resource for furthering business transparency and enabling business and state compliance with their existing obligations under international law. The database began with a recommendation in a 2013 UN fact-finding mission report on Israel’s settlements, endorsed by the Human Rights Council in March 2016. 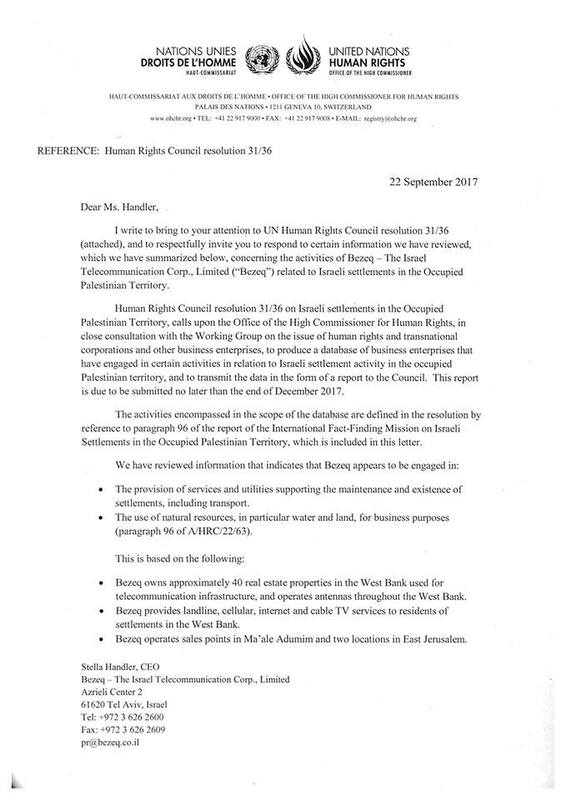 In Israel’s settlements, as the Human Rights Council’s March 2017 resolution affirmed, “it is not possible for businesses to take appropriate steps in view of the immitigable nature of the adverse impact of their activities on human rights”. All business transactions in or related to Israel’s settlements contribute to the illicit financial flows generated by the wrongful enjoyment of unlawfully appropriated property rights obtained by the Israeli government. The need to monitor the involvement of foreign and Israeli businesses in Israel’s settlements was kindled by UN Security Council Resolution 2334, which held that Israel’s settlement activity in occupied territory has “no legal validity and constitutes a flagrant violation under international law,” and called on third states to exclude settlement-based entities and activities from their dealings with Israeli entities. To date, some 18 European government advisories warned businesses of the economic, financial, and legal risks of business activities in Israel’s settlements. In recent years a host of companies, financial institutions and pension funds, among them a Norwegian government fund, Dutch pension fund, Danish bank and Dutch engineering company decided to terminate operations in the Palestinian territories. The UN database is a mechanism to document, report, and engage primary interested parties. It does not have the mandate to adjudicate the responsibility of concerned parties, nor to act as a coercive tool of law enforcement. Thus, commentators who refer to it as a “blacklist” misrepresent it and undermine its legitimacy. To maximise its effectiveness, the database must be able to engage and cooperate with businesses that operate in the territories and their home states. It cannot afford to alienate its target audiences by operating as an adjudicative or coercive body. The OHCHR should learn from the pitfalls of previous UN-led efforts to list businesses. Take the UN Center for Transnational Corporations: its mandate to report on businesses in Apartheid-era South Africa never gained adequate support because it was presented as a sanction. The UN panel on the plunder of resources in the DRC produced a list of businesses, which was discredited for failing to gain businesses’ cooperation. There is no doubt that the UN database will be embroiled in political turmoil. It may not be the first of its kind, but it could well become the first to function as a regulatory tool that gains support, and encourages compliance with international law. To ensure its ability to further respect for international law, the database should be seen as a pilot mechanism that could be used beyond the Israel-Palestine context. And the mechanism behind the database could be readily applied in other parts of the world where military occupation is used to pursue the permanent acquisition or transformation of territory.